Home :: What is a serial to Ethernet converter and how does it work? As you can see from above images a serial Ethernet converter can have one serial port or it can have multiple serial ports, up to 25 ports or more. The standard panel mount serial Ethernet converter is most common but it is also available with DIN mounts so it can easily be installed on a standard DIN rail. It is also available as a wireless converter in which case the IP/TCP packets are transmitted over a IEEE 802.11a/b/g network link. Some serial Ethernet converters only has a RS232 interface and some has a RS232 and a RS485 interface, yet others has all 3 interfaces (RS232, RS485 and RS422) built in. 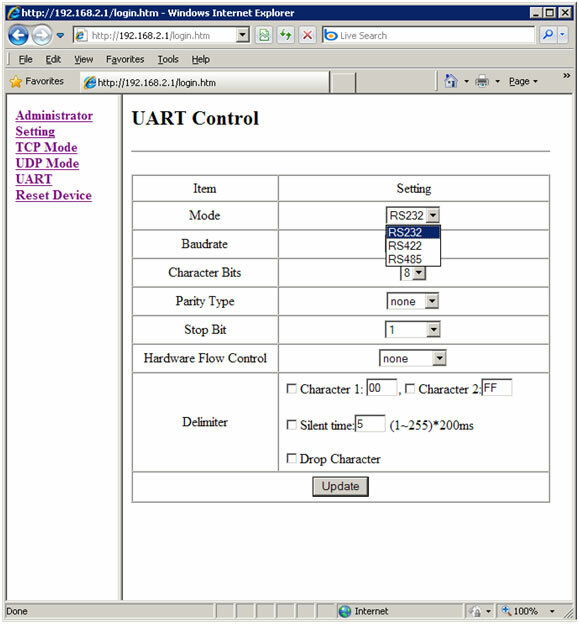 Most commonly it is used for connecting a serial RS232, RS485 or RS422 device such as a serial printer, barcode scanner, scale, GPS, sensor or any other consumer or industrial device with a serial interface, to a computer over a standard LAN network. The advantage of this is obvious; you will be able to control, monitor and communicate with your serial device remotely from a central computer. No need to walk all the way down to the other end of the factory to check your serial device. The circuitry inside the converter can convert IP/TCP packets to serial data and also convert serial data to IP/TCP packets, so it works in both directions. Before you can start using the converter you need to install driver software on your computer. 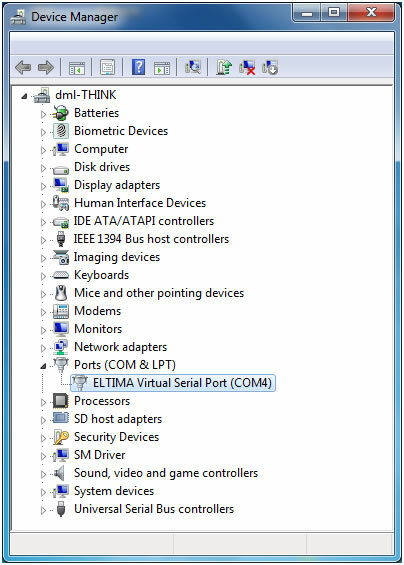 This driver software is also called virtual COM software because it creates a virtual COM port in your computer's Device Manager when the converter is connected to your computer. 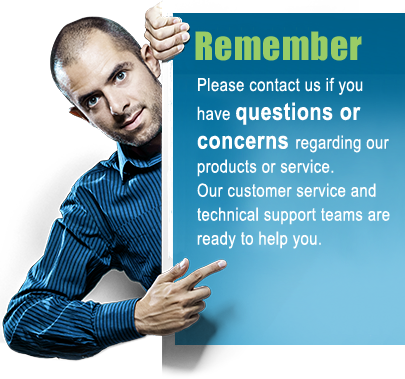 Virtual COM software is usually included with the converter, at least if you buy from a reputable seller. 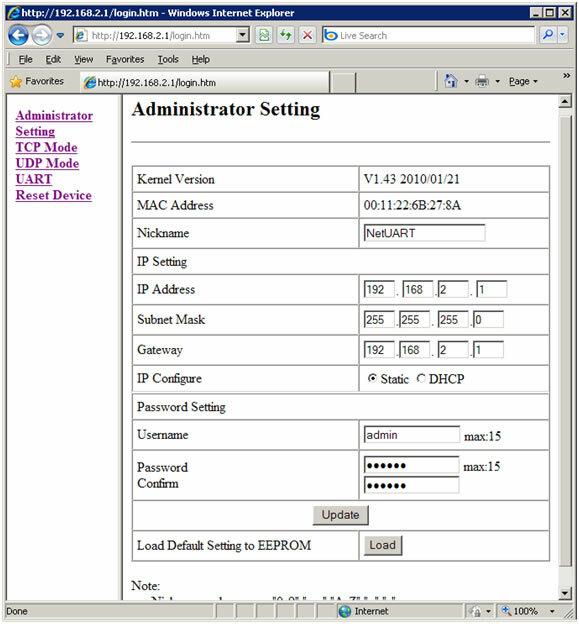 Below is an example of what the virtual COM port software looks like. 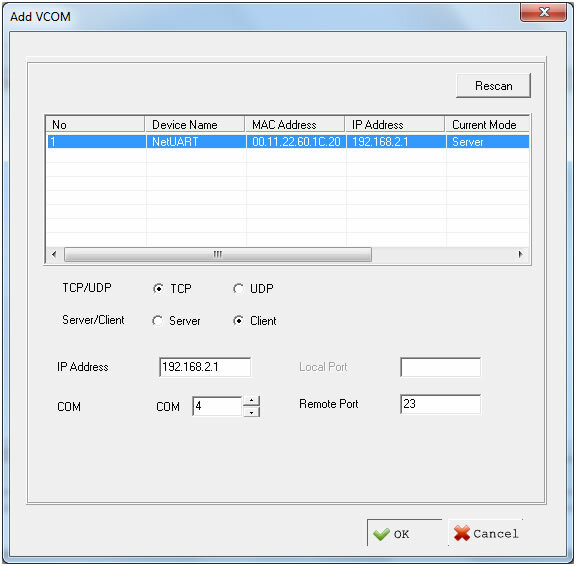 Most virtual COM software will also let you change the settings of the created COM port such as baud rate, flow control, parity bits and stop bits so it will match the settings of your serial device. The IP address of the serial Ethernet converter itself can also be changed to your preference. Changing these settings is usually done by logging in to the converter by using a standard web browser.